What happens when you release 500 christian youth into the streets of Downtown Portland? Something amazing happened a couple days ago in Portland Oregon. Let me paint the picture. Three buses, packed to the gills with youth, as well as a convoy of 100 more kids, encircled the city in four strategic locations in the NW, SW, NE and SE corners of downtown. They filled literally every single block of downtown Portland from Couch all the way to Southwest Market, from 13th Avenue, all the way down to the waterfront and Naito Parkway. 500 youth on all four sides of downtown Portland with their sleeves rolled up, wearing latex gloves and picking up trash throughout the city. They were giving cards to hand out to invite people to the Square and a conference afterwards. They stopped and gave people words of encouragement, they prayed for people, they had small conversations with folks on their way back to the rally point at Pioneer Square. 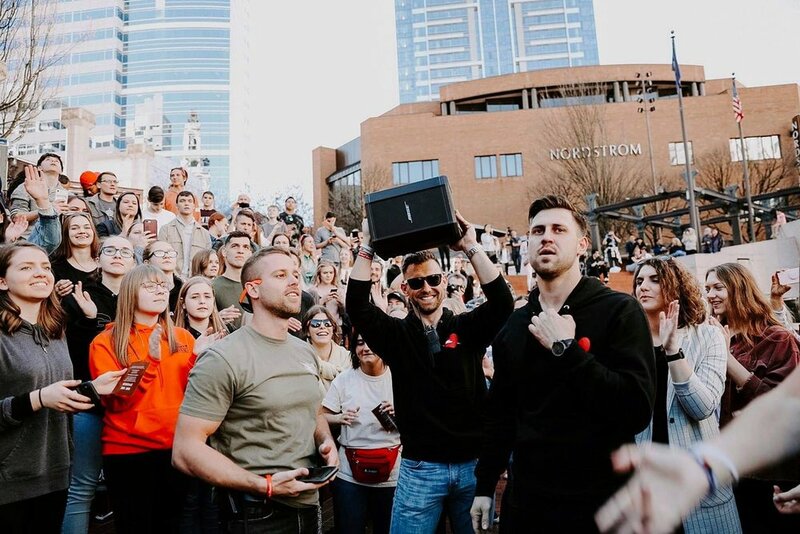 When everyone converged at Pioneer Square it erupted into a worship service that lasted 12 to 15 minutes and ended with a seven minute message where there was a call to know and to receive Christ. “... just a lot of smiles. A lot of... bystanders who were taking pictures videotaping. And from, you know, out of curiosity, people were pouring out on rooftops, and out of the windows, out of hotels and restaurants and businesses. We filled the entire block of Pioneer Square. And there was also people being grateful for healings and some people giving their lives to Jesus. Flash Love does these types of event on a weekly to monthly basis. Flash Love is a ministry started a little over five years ago with the simple objective to mobilize the community, especially the youth, to help serve single mothers, disabled veterans, the elderly and the homeless. If you would like to know more about Flash Love please visit here. This particular event was special. About four months ago, we were commissioned by Church of Truth for their upcoming conference, which was on May 30. They wanted us to take their youth that was coming from all across the United States, to experience something radically different in a way that we are the hands and feet going out, rolling up our sleeves and getting things done by building relationships and pouring our hearts into the community. So the way that we did it was we basically presented them with an idea in our style of an operation project. Our objective was to do this act of service for the city and show them who we really are, where our heart is for them. That there's a lot of misconceptions of what Christians are. We wanted to serve with an action and leave the people to make the decision for themselves about who we really are. And this is only the beginning of many, many not only cities that we will continue to serve from one side to the other, but it's going to sweep across the nation. Check out our volunteer hours in the community starting since February.